This is the way to Bowers Rock, but you’re not supposed to use it. Every time it comes up, local leaders say they’d like the public to gain access to Bowers Rock State Park. But nothing ever happens along those lines. 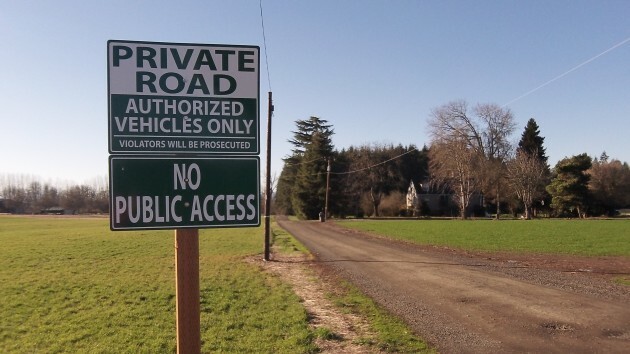 Instead, a sign on the only feasible access road — Bryant Way, which looks like a public road on the maps I’ve seen — threatens unauthorized people with prosecution if they don’t turn back. It was in 2007 when a story in the Albany Democrat-Herald — I wrote it — quoted the chairman of the Linn County Board of Commissioners that the county had been pressing the state to allow access and use of this undeveloped park. A spokesman for the state parks department said at the time that he was sure someone would be working on this during the coming biennium. Almost eight years later, nothing has happened. And last month the paper ran another story on Bowers Rock, once again quoting various voices favoring the idea of public access. It’s a scandal that the general public is still being barred from convenient access to land that the state spent public funds to acquire, starting in 1973, as part of the Willamette Greenway. Downstream from Albany, the state has done a good job with a similar tract, more recently acquired, which now is known as the Luckiamute State Natural Area. That state property has a couple of access points as well as trails, which enhance rather than interfere with the general work of saving or restoring the natural condition of the land. At Bowers Rock, residents along the dead-end western leg of Bryant Way cite a history of vandalism and trespassing, and that’s why they’re worried about more access. But a properly designed, constructed and occasionally patrolled system of parking places and trails could probably allay those fears or, better yet, prove them groundless.